On-line ticketing for this event is available until noon on Friday, May 12. Please note that the Batavia Library is hosting a book discussion in preparation for this event. 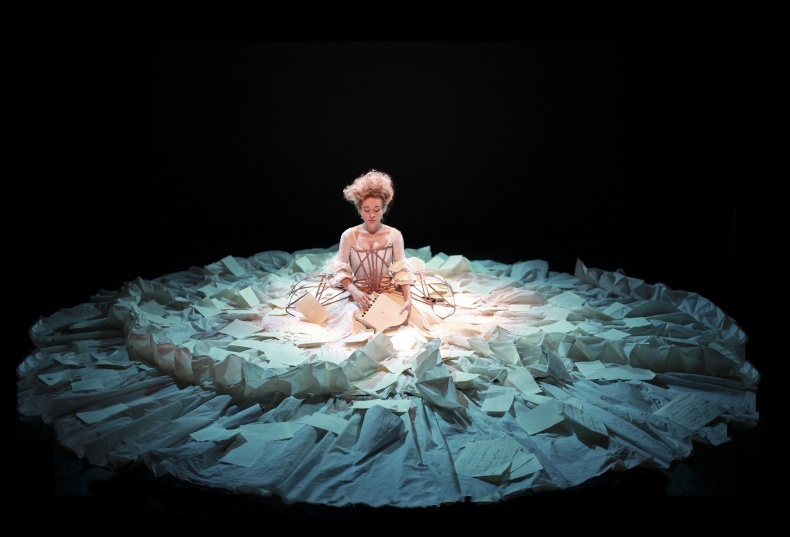 Mozart’s Sister by Nancy Moser will be the featured title on May 9 at 7:30 pm. Little Matchstick Factory’s The Other Mozart is the true and untold story of Nannerl Mozart, the sister of Amadeus – a prodigy, keyboard virtuoso and composer, who performed throughout Europe with her brother, to equal acclaim, but her work and her story faded away, lost to history. Created by Sylvia Milo, the monodrama is set in a stunning 18-foot dress (and based on facts, stories and lines pulled directly from the Mozart family’s humorous and heartbreaking letters. With the opulent beauty of the dress and hair design, the sweet smell of perfume, and the clouds of dusting powder rising from the stage, the performance creates a multi-sensual experience and transports the audience into a world of outsized beauty and delight — but also of overwhelming restrictions and prejudice. There, in communion with the audience, this other Mozart at last tells her story. The Other Mozart has been presented by the Mozarteum University and Mozarteum Foundation at the Mozart Wohnhaus in Salzburg (inside Mozarts’ apartment), by All for One Festival at the Cherry Lane Theater (NYC), the Berkshire Fringe Festival (MA), the JCSMuseum at Auburn University (AL), the Piccolo Spoleto (SC), in New Orleans, San Diego, Toronto, Munich, and Estonia. The play had a critically acclaimed Off-Broadway run in NYC at the HERE Arts Center and in London at St. James Theatre.